A failed solar experiment in the village of Dharnai has underscored the challenges of going solar in India. Photo by Gayathri Vaidyanathan. DHARNAI, India -- One year ago, environmentalists hailed this tiny village as the future of clean energy in rural India. Today, it is powered by coal. Dharnai, a community of about 3,200 people in eastern India's Bihar state, had been without electricity for three decades. So when activists with Greenpeace set up a solar-powered microgrid in July of 2014, the excitement was palpable. But, residents said, the problems started almost immediately. When the former chief minister of Bihar state visited to inaugurate the grid, villagers lined up to protest, chanting, "We want real electricity, not fake electricity!" By "real," they meant power from the central grid, generated mostly using coal. By "fake," they meant solar. Analysts say the story of Dharnai illustrates how difficult it can be to provide reliable, high-quality electricity to the world's poor without using the central grid. The challenge is coming into focus as Prime Minister Narendra Modi moves forward on an ambitious pledge to generate 175 gigawatts from utility-scale solar and wind energy by 2022 and increase coal-powered generation. Much of that power would go into the central grid, rather than being disseminated through small, decentralized energy systems. 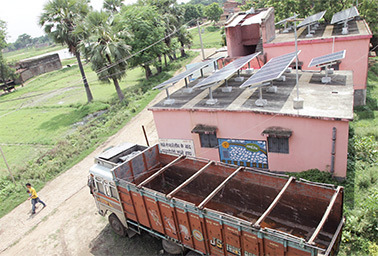 Vijay Kumar Das, a line engineer with Dharnai's electricity committee, compared the village's solar microgrid experiment to polluted groundwater. "If you don't find bottled water to drink, you have to settle for water from the hand pump," he said. "Similarly, when we did not have real electricity, we had to make do with solar power." Dharnai is in the heartland of a guerilla communist movement called Naxalism. Perhaps because of this political alliance, the community never regained the electrical supply it lost in 1981. Over the years, the community adapted. The rich set up rooftop solar panels that supplied a single light bulb or ceiling fan. Poorer people used kerosene lamps. In 2010, the villagers pooled 45,000 rupees ($680) and asked the local electricity board for a connection, but they never got it. A chance encounter last year between the village chief and a Greenpeace activist on a train brought the group to Dharnai. Greenpeace wanted to set up a solar village to show the government that it is possible to power rural communities with renewable energy. The project was important to Greenpeace's ambition. The group wants India to stop all new coal mining and coal-fired power plants because the resulting carbon emissions would contribute to climate change. The hitch is that about 400 million Indians, mostly in rural Bihar and Uttar Pradesh, remain without power. This is mainly because power lines have not reached every village and home. Greenpeace installed a solar microgrid system in Dharnai, but villagers soon learned that it couldn’t handle the load for basic household chores like cooking and ironing. Photo by Gayathri Vaidyanathan. Greenpeace, like many environmental groups, argues that these people could be supplied through decentralized solar and other renewable energies. They envision a future where 1.3 billion people globally could skip fossil-fuel-fired power plants and enter a prosperous, low-emissions world. The fallacy in this position, others argue, is that solar microgrids do not address climate change. The microgrids do not displace coal use because the target villages were never hooked to the central grid in the first place. In fact, in parts of India, microgrids have become a stopgap solution for the energy-poor while they wait for the central grid. "I'd agree 100 percent this is primarily a development solution, not a climate solution," said Justin Guay, climate program officer at the David and Lucile Packard Foundation who was previously with the Sierra Club. The Indian government plans to expand the central grid and has promised that every citizen will have reliable electricity by 2022. By June, the energy ministry estimated it had already brought about 60 percent of India's 714,204 unwired villages online. To meet the needs of 1.2 billion citizens, the government plans to double coal extraction to 1.5 billion metric tons by the end of the decade and quadruple its renewable energy capacity. At the same time, officials have promised that with international assistance India will increase the share of non-fossil-based capacity in its energy mix to 40 percent by 2030, up from 30 percent today. But analysts say that boosting those clean energy levels will not be easy. 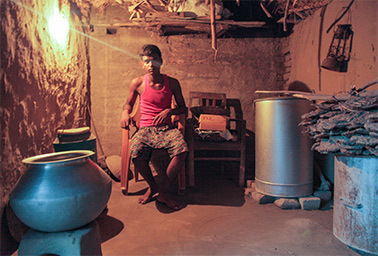 Rupesh Kumar, an 11th-grader in Dharnai, grew up studying by the light of kerosene lanterns. He was hopeful when Greenpeace representatives came to his family's two-room house, walking past two buffaloes tied at the front porch. They promised him a light bulb he could study by. He hopes to be the first in his family to go to college and get a job other than farming. Over three months, engineers set up 70 kilowatts of photovoltaic cells on the rooftop of public buildings scattered throughout the village. They installed 224 batteries to store the energy. Artists painted a cheerful mural of rainbows and birds on the wall of the village chief's office, branding the village "Dharnai Live." The village also has a website. All told, the installation cost 2.7 crore rupees ($407,050). Solar power failed Rupesh Kumar, an 11th-grader in Dharnai, when he wanted to study before his farming chores at dawn. Photo by Gayathri Vaidyanathan. Kumar's family received one compact fluorescent light bulb and a wall outlet to charge their mobile phone. The power would be free for six months and then cost 70 rupees per month. That comes to about $1, but a steep price tag in a place where poor people earn, on average, the equivalent of about 30 cents per day. Most of Kumar's neighbors could not afford it. In the more prosperous part of the village, well-to-do families already had rooftop solar panels. But Greenpeace's microgrid promised to be more reliable, and many of them signed up, as well. The day the power came was one of celebration. Villagers, rich and poor alike, ate sweets. Then, the wealthy families plugged in energy-inefficient televisions and refrigerators. With the power suddenly facing heavy demand, the batteries drained within hours. When Kumar woke up at 4 a.m. before his farming duties to study, the light bulb did not work. "I think it's wrong that when I studied, the power would get cut," he said. The microgrid operators scrambled to fix the mess. The village electrification committee decided to restrict electricity supply to five hours at nighttime. 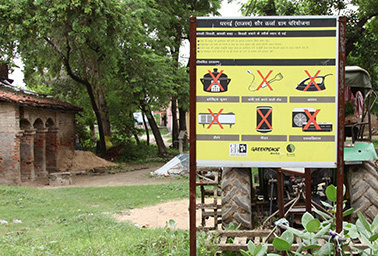 Greenpeace put up posters telling people not to use energy-hungry appliances such as rice cookers, electric water heaters, irons, space heaters and air coolers. 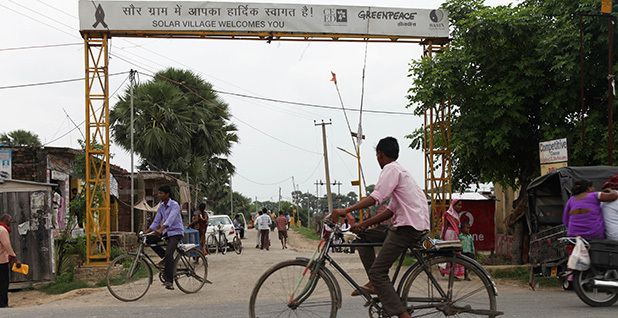 One month after the rollout, Greenpeace invited Bihar's former chief minister, Nitish Kumar, to inaugurate the solar village. A head of state visiting a small village under the glare of television cameras is a huge deal, and the citizens knew it was their best chance to get a permanent solution. Children held placards and the adults chanted their mantra asking for "real" electricity. One week later, trucks rolled in and set up a 100-kW transformer in town, connecting Dharnai to the grid. Power is now free for Kumar and his neighbors who are below the poverty line. Others pay 3 rupees per kilowatt-hour of electricity. As of July, villagers were getting electricity day and night, albeit with power cuts. At such times, they'd use the microgrid as a backup. Meanwhile, enrollment in the solar program has fallen to 120 households, down from 380 at the start, according to Ramapati Kumar of the Centre for Environment and Energy Development, which operates the system now. He previously headed Greenpeace India's renewable energy program. Dharnai is a work in progress, and the microgrid is operating as it was designed, he said. He hopes that the generated power will get fed into the central grid in the future. India, at present, does not have a policy to handle such inputs. At present, solar power in Dharnai costs at least three times as much as grid power. It can support only expensive energy-efficient appliances, such as CFL bulbs. A CFL bulb in India costs 700 rupees ($10), while an incandescent bulb costs 10 rupees (15 cents). M.V. Ramana, a physicist at Princeton University who has studied energy access in India, questioned the ethics of foisting an expensive solution on the poor, who've historically contributed so little to global warming. "I strongly encourage [microgrids] for urban, upper classes of people who can afford it," he said. "But [I would] not do it on the backs of people who are poor and who can't afford these experiments." Grid power, which in India's case is mostly coal-based, generates enough electricity to power factories, agricultural processing, hospitals, schools and malls, all of which drive human development and create jobs, said Alex Trembath, a senior analyst at the California-based Breakthrough Institute. Months after the rollout of dozens of solar rooftop panels in Dharnai, the chief minister ordered the village connected to the central grid. Photo by Gayathri Vaidyanathan. Groups that claim that microgrids can fuel similar levels of development are "conducting clean energy and climate policy on the backs of the global poor," he also argued. Guay of the Packard Foundation strongly disagreed and said that even a single light bulb powered by a microgrid is valuable to someone without power. Decentralized grids are solutions of the future while the central grid is like "whale oil," he said. "It has everything to do with progress," Guay said. "I don't think you will see a single person say that the poor should continue to use whale oil in the 21st century and call that ethical and progressive." Only a small number of villages are too remote to be hooked to the central grid and would be good candidates for microgrid-only solutions, Ramana said. The government has identified 12,771 such villages. There are also thousands of hamlets where fewer than 100 families live that could benefit, other experts said. As the sun set in Dharnai on a recent summer evening, Greenpeace's solar-powered street lamps switched on and pooled white light along the thoroughfare. Villagers chatted on streets that would have once been pitch-dark. Life has improved after Greenpeace came, they said. Not because the group brought solar. Rather, they said, they appreciate that the group brought the chief minister, who brought in the grid. Yet a canopy of wires and plastic bottles overhanging Dharnai's streets is also evidence of India's problematic central grid. Though the villagers prefer it to solar, they acknowledge the government's supply is unreliable. The cuts are a reminder that India's electricity demand far outstrips supply. Bihar's power plants this year are generating 21 percent less electricity than needed during peak demand. The government has never mulled whether it should keep coal in the ground for the sake of the climate because it can use all of the power it can get, Ramana explained. Toward that end, India has announced an ambitious plan to install 100 GW of solar by 2022, up from 3 GW today. The target would be difficult to achieve in the next few decades, analysts say. Solar photovoltaics are not cost-competitive with coal. And India's aging grid cannot handle the fluctuations in capacity that occur when the wind dies or the sun hides behind clouds. Christopher Field, director of the Carnegie Institution for Science's Department of Global Ecology and an active participant in the Intergovernmental Panel on Climate Change, said that rich nations have a moral responsibility to make renewables more affordable in the developing world. Until that happens, coal plants will continue being built in India in the near future, Field said in an interview in August. "Right now, if I were Prime Minister Modi, I'd be saying, 'Gee, I can deliver coal-based electricity way cheaper than I can deliver renewables," he said.